AC Schnitzer has plied its tuning skills on the latest iteration of the BMW Z4 and produced a car with more aggressive styling and a most welcomed 54 more horses. It'll look great sitting outside the spa. AC Schnitzer's been somewhat tasteful with the Z4. The upgraded styling includes the addition of de rigeur fender vents — because what car doesn't need those these days — as well as a revised chin spoiler, trunk lid and exhaust tips. Add to that the bigger wheels and, most importantly, upgrades to the 3.5i twin turbo straight six. 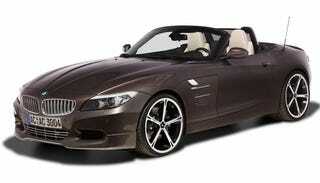 Those engine enhancements take the now-Schnitzer-ized Z4 from 306 HP to 360 HP. Not too bad. Standing on AC Schnitzer Type IV in 18" or Type VI wheels in 18, 19 or 20 inch, the BMW Z4 takes to the stage for its world premiere. A striking entrance from the Aachen specialist, which will certainly not be forgotten in a hurry. AC Schnitzer aluminium gear knob chromed or "Black Line"